This really is a great album. It's hard hitting and heavy but the lyrics are more intelligent and thoughtful than you might at first expect, and there are plenty of subtle touches in the album. It’s less than five years since metal band King 810, from Flint, Michigan, hit the scene with the release of their debut album, “Memoirs of a murderer”. Initially they divided opinion among metal fans in the UK but a 2017 appearance at Bloodstock open air saw them win over a lot of sceptical people with their brutally heavy no nonsense performance. The band’s music is heavy and aggressive – partly perhaps a reflection on their hometown of Flint – a city that has topped polls of “most violent cities” regularly and has extremely high rates of crime including murder and high rates of unemployment. If it wasnt for a crisis that saw it’s water deemed unsafe to drink for several years due to high levels of lead contamination from water pipes then that would be the only claim to fame Flint has. It’s a tough place to grow up and it explains why King 810 are the band they are. 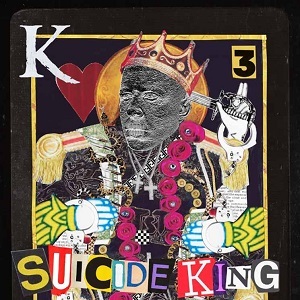 Their third album, “Suicide king” will be released later this month. opening track, “Heartbeats” starts with a voice saying “How can we give them something new that’s serious but entertaining too?”. It may well be what David Gunn asked himself at the start of the writing process for this album as the finished album is both serious and entertaining. You can listen to the album on two levels. Firstly just enjoying the music and the vocal lines – it’s a great album that you can enjoy like that, but to get the most out of it you need to listen to the lyrics more closely. The closing part of “Bang guns” is soft and melodic and not what you might at first expect from a band this heavy – it’s nice to see them include bits like this amidst the heaviness of the album. This really is a great album. It’s hard hitting and heavy but the lyrics are more intelligent and thoughtful than you might at first expect, and there are plenty of subtle touches in the album.